Fall is in the Air! We were mid 60*'s today!! (I know, woooo, lol)? I couldn't resist doing an ULTIMATE Fall glam card! 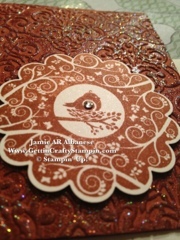 Grabbing my Lacy Brocade Textured Impressions Embossing Folder from the Holiday Mini, my Big Shot, Versa Mark stamp pad, Iridescent Ice embossing glitter powder and this STUNNING Hostess Four Seasons stamp set! The Cajun Craze cardstock, ink and my Shimmer White paper, the large 2-3/8" Scallop Circle punch and the Adhesive Backed Rhinestones just are the staples for this card. I adore this on its own! Now, celebrate Fall with me here!! Ok so I Love butterflies! 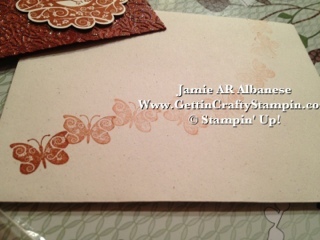 So instead of the stamp, in this set, with the Fall leaves, I used the Spring stamp with branches and butterflies. 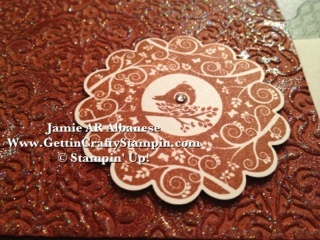 Cajun Craze ink on the Shimmer paper really makes it embrace Fall. 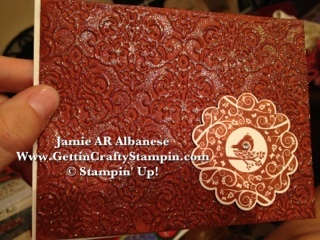 The Scallop Punch is ideal for a cool look and fits all the stamps in this set. I'm not a big bird person but this set has the sweetest birds in the center! 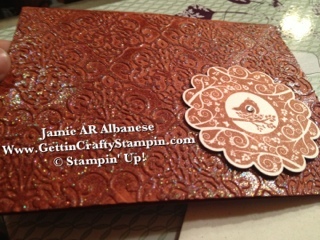 The Shimmer paper is a very subtle shimmer but ties into shimmer of the card. The lil dash of BLING of the rhinestone in the center of the bird wing just ties it all together! 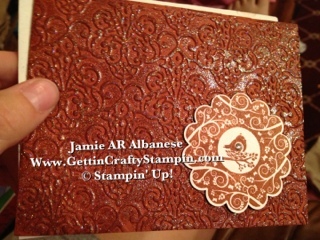 The Stampin' Dimensional adhesive is necessary (and like 4 of them) to grab the card through the texture from the embossing folder and the glittery ice. So, embrace Fall with me! Give this to your hostess or family members for Thanksgiving. 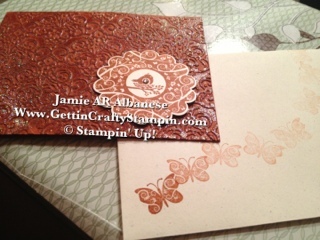 The LNS challenge of Thanksgiving cards this week gets a nod from me! Happy Fall Y'all!